The new Richard Mille this year — multi-year athlete/ambassador and tennis superstar Rafael Nadal also gets a new piece. The new Richard Mille Tourbillon RM 27-01 ‘Rafael Nadal Watch’ — designed in collaboration with Rafael Nadal — follows the original RM 027 from 2010. Not only is the look is vastly different but so is the engineering. 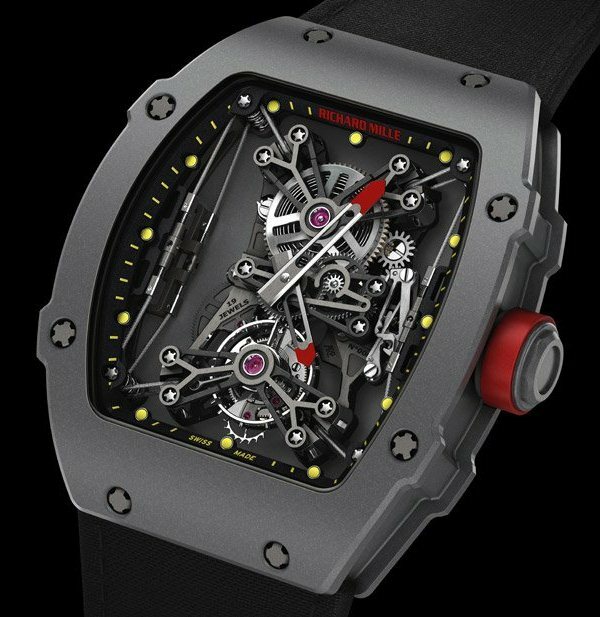 Its ultra-light carbon case and complex architecture reflects Mille’s desire to create a movement held in total suspension in its case. Indeed, this is one of the more avant-garde and innovative architectural constructions seen in recent times — I’ll walk you through all the details, below. The RM 27-01 has a baseplate attached by four braided steel cables just 0.35mm in diameter. The cables are held taut by an ingenious system of tensioners (located at 3′ and 9′) and pulleys positioned at the four corners of the movement. Each cable is fixed to the tensioner, passes over the upper pulley and into the movement before returning to the lower pulley. Once the cables are threaded, the watchmaker tensions them by rotating a central tensioner ring . All said and done, Mille suggests that this enables the caliber to withstand tensions of 5,000 G.
As one seeks to comprehend this process, I was reminded of the process of stringing a tennis racket and Voila! 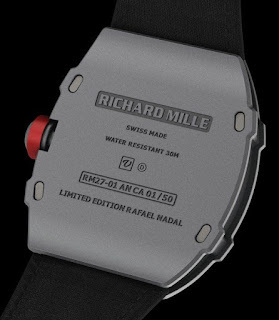 The Mille genius of building his watches to be sympatico with his athletes is recognized! This structure combines strength and flexibility to protect the ultra-light movement which clocks in at a mere 3.5 grams. This ultra-light movement is due to the use of titanium baseplate and tourbillon carriage as well as aluminum-lithium for the barrel bridges and gear trains. The overall watch weights in at a mere 19 grams — Velcro strap included. The original RM 27 was 21 grams, sans strap, I believe. Word is that Rafa is now playing all his tournaments in the RM27-01!